An armored 1979 Land Rover Series III is on eBay right now, which supposedly enforced order in the siege of London's Iranian embassy in 1980 and the London Poll Tax Riots ten years later. 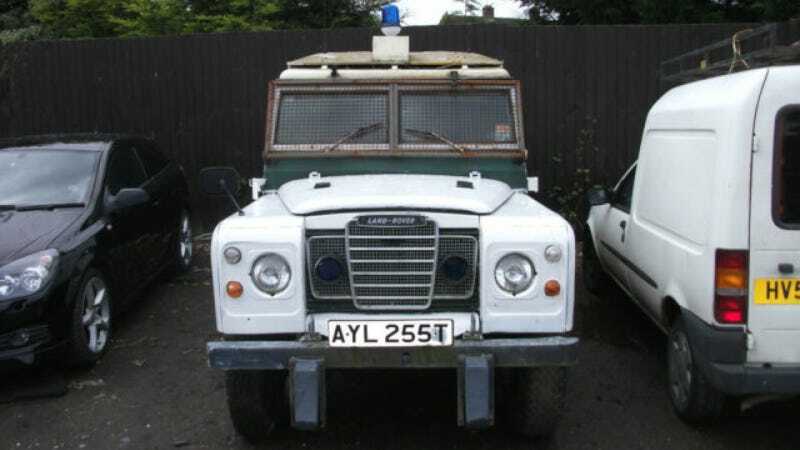 Seller also claims the Rover retired to TV stardom on "Juliet Bravo." Pedigree or no, it's a beautiful beast. The seller was kind enough to include a news clip from the embassy incident, claiming the Land Rover at about 5:15 is the one on offer here. Neat! I couldn't find it in a few seconds of scrubbing Juliet Bravo on YouTube... but maybe you'll have more luck. The auction ends on May 20th, and price is parked at £3,600 pounds as of this writing. It's a little rusty (which, yes, I can confirm without looking at it) but this thing's definitely worth saving for your local volunteer fire department, overland adventure into dangerous territory, or bomb squad on-a-budget. Hat tip to BT, images from eBay.